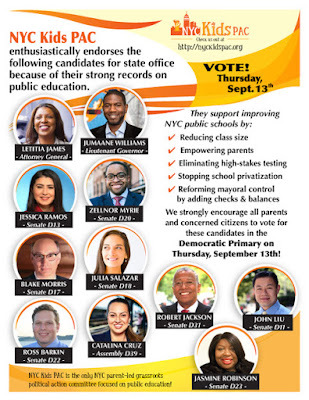 NYC Public School Parents: NYC Kids PAC endorsements for Thursday's Democratic primary; please vote! NYC Kids PAC endorsements for Thursday's Democratic primary; please vote! 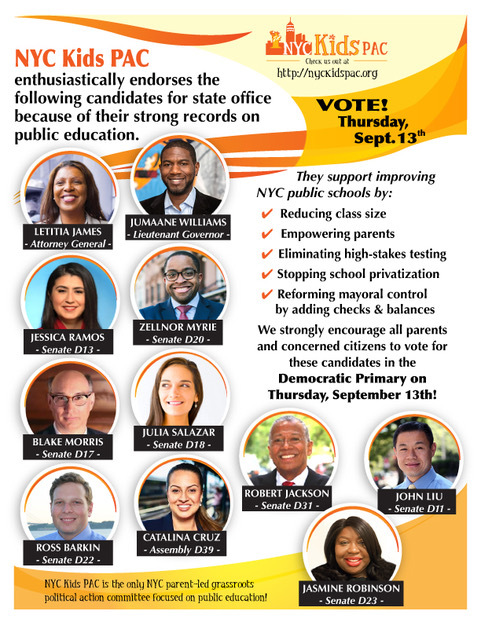 NYC Kids PAC has made our final round of endorsements for the Democratic primary which will be held THIS Thursday, September 13. All these candidates had strong responses to our candidate surveys, and records of supporting our public schools. More specifically, they support reducing class size, empowering parents, lessening high-stakes testing, stopping school privatization, and reforming mayoral control by adding checks and balances. We urge you to go vote for these candidates on Thursday. You can also download our flyer here – and hand it out in front of your school or share it with friends and colleagues via email or social media. The polls will be open from 6 AM to 9 PM. If you’re not sure which if any of these candidates are running for election in your district, you can check out your ballot and your polling place by entering your address here.